all' inside of the typical historical centre , in the immediate vicinity of all services and all amenities , also close to the main square and the seafront , located on the second floor of neat building , a large three-roomed apartment internally comprises entrance hall , living room with separate kitchen , double bedroom , single bedroom and bathroom with shower ; external terrace of exclusive pertinence with a view on the central street ; good state of the interior ; expenses, quantized in about € 600,00 / year ; thanks to its characteristics the property in question lends itself perfectly to be used as a first residence to live throughout the annual period , or alternatively as a second home for your vacations ; even as an investment for the realisation of income from summer rentals. inside a characteristic residential area , close to the popular seaside resort and in the immediate vicinity of the centre and all the services , located on the first floor of cared for condominium complex , a large three-roomed apartment internally arranged on two levels and consists of : ground floor: entrance , living room with kitchen , double bedroom , single bedroom and bathroom with shower ; the upper floor is reached by a easy wooden staircase to the spacious attic / loft in its highest point with a height around 175 cm consisting of a single room with a bathroom of service ; expenses ordinary quantized in about € 800,00 / year ; heating / cooling available through stove hydro pellet installed at a height of the living area from the current part promisor seller and air conditioners, generating hot / cold ; excellent condition of the interior ; double terrace duplex, all' height of the living area , the second the height of the sleeping area ; convenient parking garage of about 20 sqm, located under the accommodation ; for the purposes of maximum correctness and transparency , in particular, in respect of the part promissaria buyer communicates that the property in question is encumbered by a loan ( mortgage purchase first home at a great fixed-rate contract through the local credit institution for an amount of the real estate agency will take care to communicate to the visit of the property, thanks to its characteristics the property in question lends itself perfectly to be conceived as the first residence to live throughout the annual period. in a comfortable position and reserved all' inside of a distinctive and cured residential complex , close to the city centre and also close to the popular seaside resort , located on the first floor with good ease of access , large two-roomed apartment placed on two levels and internally composed on the ground floor / first hall , living room with separate kitchen , large terrace with views of the hills and a bathroom with bathtub ; the upper floor / above a large room used as a loft / attic with large double room, with proceeds due to the demands of the current property and a further space for extra bed, and a bathroom of service ; monthly charges morigerate ; parking of exclusive pertinence is located near the house ; excellent condition of the interior ; thanks to its characteristics, the property lends itself perfectly to being used as a second residence for their summer holidays ; in the alternative as a first home for a small family ; even as an investment to be used as the realisation of income from summer rentals. PORTO AZZURRO: all 'inside of comfortable residential complex, recently built in a strategic location to all amenities, bright three-room apartment on two levels, the ground floor consists of small private garden, entrance with living room / kitchenette, double bedroom with private terrace, and bathroom; to the first floor master bedroom and bathroom on the second floor with a spiral staircase connecting double attic room. Attached to the garage property pertaining to about 15 square meters, and two cellars. Good investment to use as a primary residence and also as a solution to be allocated to income gains or losses realized by summer rentals. 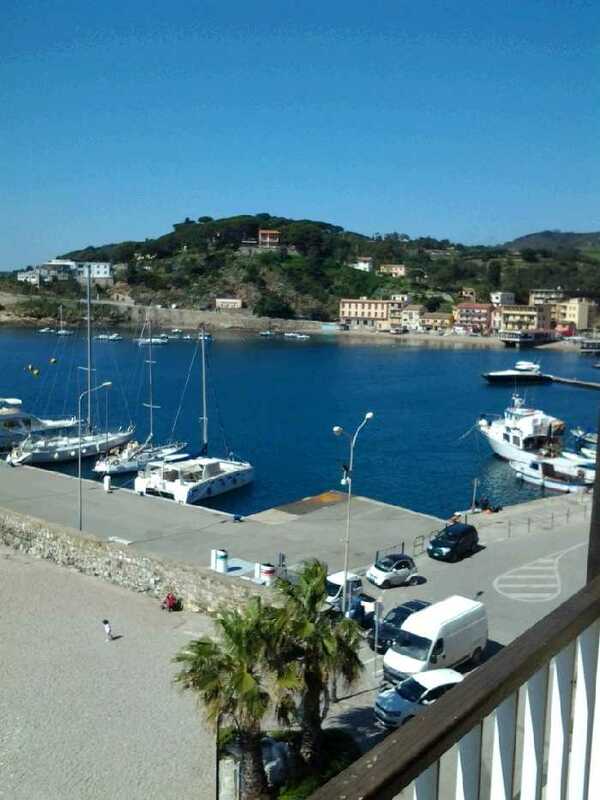 PORTO AZZURRO: sale studio apartment in the historical part of the town with beautiful panoramic views. Consisting of one room with living room / kitchen area divided by a small wall with dividers to create a second area used as a bedroom. Bathroom with shower. The mmobile enjoys a small private garden fitted with barbecue and outdoor furniture. The apartment is on sale fully furnished, equipped with energy certificate APE class G.
PORTO AZZURRO: In prestigious building located 20 meters from the beach, apartment with large living room / kitchen area with access to the balcony with open sea views, master bedroom, bathroom. garage. close to the centre and all the services , inside a comfortable building , located on the second floor without elevator , spacious three bedroom apartment internally comprises entrance hall , lounge , kitchen, double bedroom , second double bedroom , third single bedroom , bathroom with shower, and a bathroom with a bath tub ; terrace ; heating by means of heat pumps hot / cold ; good interior ; no fee condo to be if not a small monthly expenditure estimated at about 20 € / month , arising from the agreement of the condominiums , for the property , relating to the cleaning and lighting of the stairs ; thanks to its characteristics the property in question lends itself perfectly to be used as the first residence for the entire annual period ; the likely possibility of splitting into two units to generate good income from summer rentals. in the immediate vicinity of the characteristic main square and a typical dock , located on the third floor and last of a small building consisting of only four units , a large apartment, multi compartments internally composed by: entrance , large living area, or conceptually, can be transformed as such is structured by three rooms with panoramic views of the gulf and with a beautiful view of the sea thanks to a large enclosed porch ; similarly, and from the opposite side with a view of the center , the cooking area and the sleeping area is composed of a compartment for use of the kitchen with utility room , two rooms to be assigned with much probability as the first room and a second bedroom and bathroom with shower ; because of the large spaces , due to the excellent distribution of the interior and the nature of the partition walls non-load bearing there is a good possibility of distribution of the interior according to your needs ; status of the interior to be restored ; possibility of preventive and aid in general in the restructuring by the construction company and the technical confidence of the agency ; thanks to its characteristics the property in question lends itself perfectly to be used as a first residence to live throughout the annual period ; alternatively also as a second home for your vacations or as a investment for the realisation of income from rentals, winter / summer, thanks to a good potential income expected ; the possibility of transformation in a small bed and breakfast / room service for breakfast . in a central position , inside the picturesque main square , in the immediate vicinity of the small cove and of the characteristic historical center , located on the first floor of a comfortable building , a large three-roomed apartment internally comprises entrance hall , living room with kitchen , double bedroom , second double bedroom and a bathroom with shower ; garden of exclusive pertinence, on the back of the property in question ; a good state of the interior ; and large sea-view ; possibility of parking space in the adjacent public parking spaces ; free condominium expenses ; thanks to its characteristics the property in question lends itself perfectly to be conceived as the first residence to live throughout the annual period ; or as a second home for your vacations. Reserved negotiation in agency. Porto Azzurro, just outside the village, with beautiful sea view in a lovely condominium, for sale two-room apartment of about 40 sqm, internally composed of living room with kitchenette and sofa bed, double bedroom with double bed and bunk bed, bathroom with shower. Terrace of about 15 sqm with sea view and parking place. inside a characteristic residential area , a few steps from the centre and from all services , in a condominium edited, and changes expenses , two-roomed apartment of 45 sqm located on the first floor, internally composed of: kitchen, living room, bedroom and bathroom. Terrace and parking place. PORTO AZZURRO: about 300 meters from the sea and from the centre of town, comfortable apartment, free on three sides, arranged on two levels and internally comprising of: ground floor entrance hall and storage cupboard under the stairs, on the upper floor eat-in kitchen with balcony, living room , bedroom double bed, bedroom with wardrobes and two bathrooms. The storage room outside. Thanks to its characteristics, the subject matter lends itself perfectly as a solution to residential real estate year-round and summer. Porto Azzurro: near the center and all facilities, in a convenient building, second floor, for sale three-room apartment, internally comprises: entrance hall, lounge, kitchen, bedroom, bathroom and balcony. Car ownership. 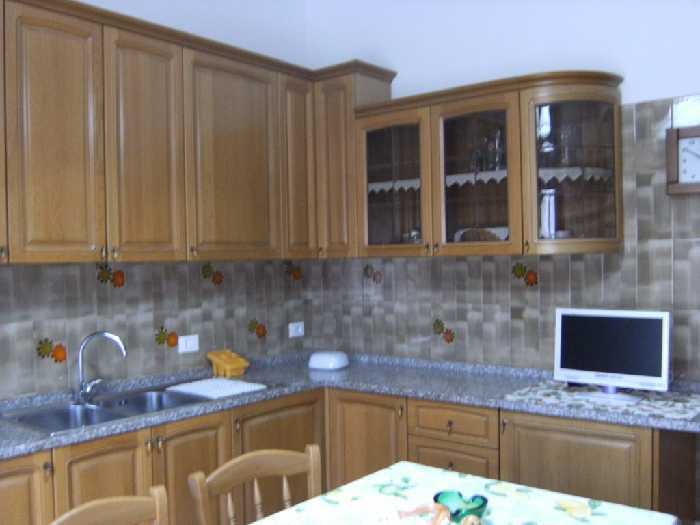 Porto Azzurro, in the center of the country internamete sale apartment with living room, kitchen, two bedrooms and bathroom. PORTO AZZURRO: about three hundred metres from the centre of the village , in quiet and convenient location , at the second and last floor of a comfortable building, for sale four-room apartment, free on three milks, internally composed of: living room with kitchenette, three double bedrooms, one with bathroom, second bathroom and terrace; good interior ; good solution to use as a first residence to live all year round. PORTO AZZURRO: all 'inside of comfortable residential complex recently built (circa 2006) in a convenient location to all amenities, bright three-room apartment on two levels, the ground floor consists of small private garden, entrance with living room and kitchenette , master bedroom with private balcony, and bathroom; downstairs with a spiral staircase to two double bedrooms and bathroom connection. Attached to the garage property pertaining to about 15 square meters. and two cellars of about 7 square meters each. Good investment to use as a primary residence and also as a solution to be allocated to income gains or losses realized by summer rentals. in a position near the centre , a few steps from the centre and from all services , on the second floor of a characteristic building , a large three-roomed apartment internally comprises entrance hall , living room with kitchen , double bedroom , second double bedroom and bathroom with shower ; large terrace ; excellent condition of the interior ; expenses morigerate ; thanks to its characteristics the property in question lends itself perfectly to be used as a first residence to live throughout the annual period , or alternatively as a holiday home. Porto Azzurro: exclusive area just a few steps from the main square and along the sea, for sale terraced house on several levels so divided: the ground floor independent entrance directly from the terrace, living room with kitchenette , through the internal staircase leads to the upper floor where we find the bedroom with balcony and bathroom. The floor above the bedroom with sloping ceilings with three beds. In the basement, the garage,a double bedroom and a second bathroom. Thanks to its characteristics, the property lends itself perfectly to be used as a first residence to live throughout the annual period. PORTO AZZURRO: in a prestigious building with elevator, large apartment, internally comprises: entrance hall, large living room, kitchen, double bedroom, two single bedrooms, a single bedroom with bathroom and a further two bathrooms with shower. panoramic view of the gulf of Porto Azzurro. inside a characteristic residential area , close to the city centre and all amenities , also close to the small seaside town , situated in well-kept condominium complex with only four units , large three-room apartment located on the second floor , internally composed of entrance , living room with terrace, separate kitchen , utility room , master bedroom , second bedroom with balcony and bathroom with shower , good condition of the interior ; expenses, quantized in about € 300,00 per year ; heating through radiators ; two garage underlying the property , the first of their approximately 16 sqm , the second of the respective mq 23 ; thanks to its characteristics the property in question lends itself perfectly to be used as a first residence to live throughout the annual period. PORTOAZZURRO: all' inside of the main square , in a strategic and convenient location , also in the immediate vicinity of the historic centre and the beach , located on the first floor of the historical building , a large three-roomed apartment internally comprises entrance hall , living room with kitchen , double bedroom , twin bedroom, closet and bathroom with shower ; small garden on the back of the house is particularly suitable for enjoy the fresh moments of summer'; thanks to its characteristics the property in question lends itself perfectly and be used as a first residence to live throughout the annual period , or alternatively as a second home for his holidays. 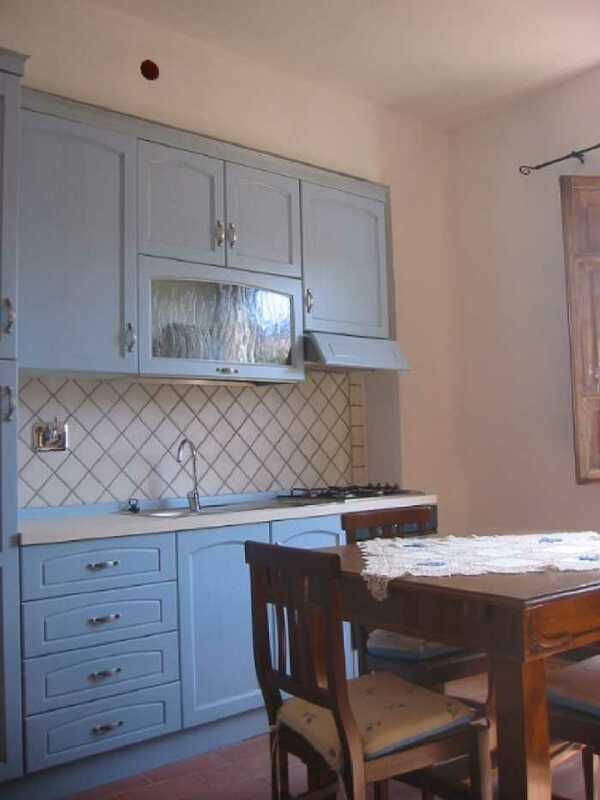 PORTO AZZURRO: sale apartment consisting of four living room, kitchen, two double bedrooms, small bedroom single, bathroom and large attic / utility room of about 25 square meters. in semi-central location in the immediate vicinity of the port, the historic center and all amenities, bright apartment on the first floor, internally comprises: living room, kitchen, two double bedrooms, two bathrooms, utility room and terrace of 30 sqm. Good finish of the interior. in a position near the centre , a few steps from the centre and from all services , also in the immediate vicinity of the main square and promenade , a portion of a single-family house with a typical front of the island of elba , in the case of the three-room apartment located on the first floor and internally composed of: entrance , living room with kitchen , double bedroom and bathroom with shower ; balcony with sea view ; parking area for cars not assigned in the vicinity of the structure ; the excellent condition of the interior ; thanks to its characteristics the property in question lends itself perfectly to being conceived as the first residence to live all year round , alternatively also as a second home for your vacations or as a investment for the realisation of income from rentals winter / summer ; good potential income documented. in a position near the centre , a few steps from the centre and from all services , also in the immediate vicinity of the main square and promenade , a portion of a single-family house with a typical front of the island of elba , in the case of the three-room apartment located on the ground floor and internally comprises entrance hall , living room with kitchen , double bedroom , second bedroom, and a bathroom with shower ; parking area for cars not assigned in the vicinity of the structure ; the excellent condition of the interior ; small courtyard for the exclusive use placed in front of the property ; thanks to its characteristics the property in question lends itself perfectly to being conceived as the first residence to live all year round , alternatively also as a second home for your vacations or as a investment for the realisation of income from rentals winter / summer ; good potential income documented. Venturina: in a quiet place, immersed in the green, near the thermal centre of Venturina Terme, in the Municipality of Campiglia Marittima one of the most beautiful historical towns of Val di Cornia, on sale in two separate buildings of new construction in the definition phase, with five-and eight apartments of various sizes. Two-bedroom apartments are internally composed by living room with kitchenette, double bedroom and bathroom. Outside space and garden. Garage of 20 sqm. Three-room apartments, internally composed of living room with kitchenette, double bedroom, single bedroom and bathroom. Outside space and garden. Garage of 20 sqm. Three-room apartments, internally composed of living room with kitchenette, two double bedrooms and bathroom. Outside space and garden. Garage of 20 sqm. The construction is carried out in the bio building, with all the tricks about the latest news regarding energy saving and energy certification of buildings; the finest materials available in the specification, with the possibility of customize according to the needs of the customer. SIZE: from 58 sqm up to 110 sqm. Square footage of GARDEN: starting from 69 sqm to 209 sqm REQUEST : starting from € 172.000,00 up to € 330.000,00. PORTO AZZURRO : within a small residence surrounded by greenery at two steps from the beach Real, for sale apartment of 40 sqm located on the ground floor with terrace. 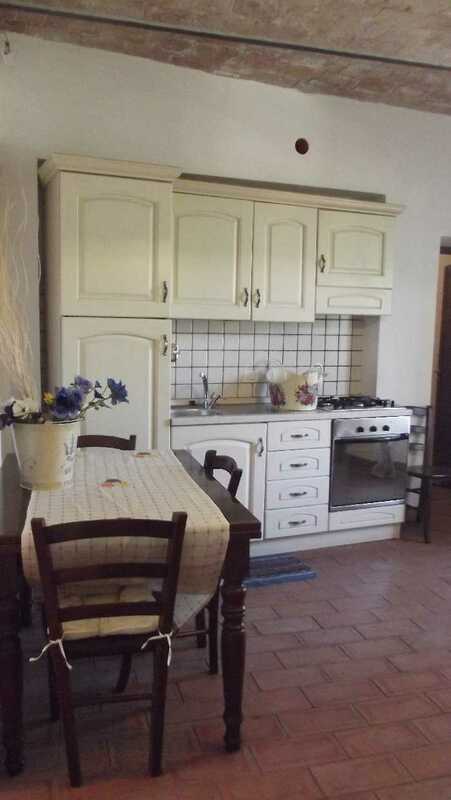 The property is internally composed of: living room with kitchenette, double bedroom and bathroom. Good condition of interior as by the recently renovated; provision for climate control through heat pumps. Assigned parking space in the courtyard condominium ; thanks to its characteristics the property in question lends itself perfectly to be used as a first residence to live throughout the annual period. PORTO AZZURRO: about 500 meters from the sea and from the centre of town, comfortable apartment, recently renovated, set on two levels and internally arranged as follows: ground floor: garden , living room with kitchenette, and a bathroom, basement connected to ground floor by a spiral staircase or directly from the garden you will find two bedrooms with a door, a bathroom window. Thanks to its characteristics, the subject matter lends itself perfectly as a solution to residential real estate year-round and summer. Parking place opposite the house. 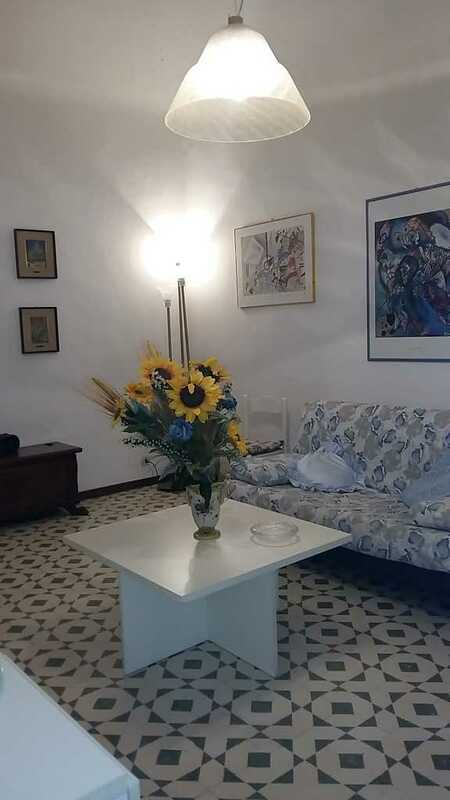 PORTO AZZURRO: in semi-central location, convenient services, located on the ground floor of the building feature, two-room apartment inside a living room with kitchenette, bedroom, bathroom and garden. Car ownership. Good opportunity to be used as investment income gains or losses realized by an annual / interim lease; request is negotiable. 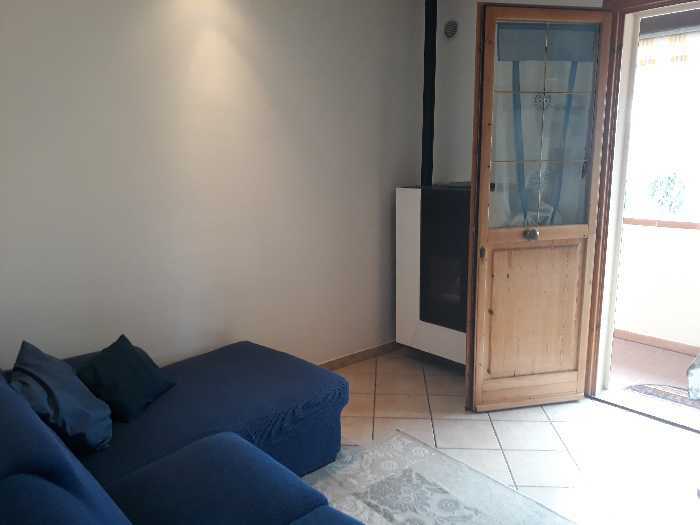 in a convenient area within walking distance from Porto Azzurro and Capoliveri we propose two-room apartment of about 37 square meters, internally composed of living room with kitchenette, bedroom and bathroom. Terrace with sea view and parking space. Controlled air-conditioning / heating. Good repair. PORTO AZZURRO: Centrally located just steps from the sea and of the square, on sale on the first floor of an apartment building, large apartment of 110 square meters, internally comprises: entrance hall, living room with kitchenette, double bedroom, two single bedrooms, two bathrooms , utility room and balcony. Private parking. Heating with oil boiler. Thanks to its characteristics the object in question lends itself to be used as first residence; good condition of the interior. in a convenient services and a short walk from the seafront of the picturesque village of fishermen, we offer two-room apartment of about 33 square meters, it consists of a small living room with kitchenette, bedroom and bathroom. Air conditioning system. No building. Good repair.